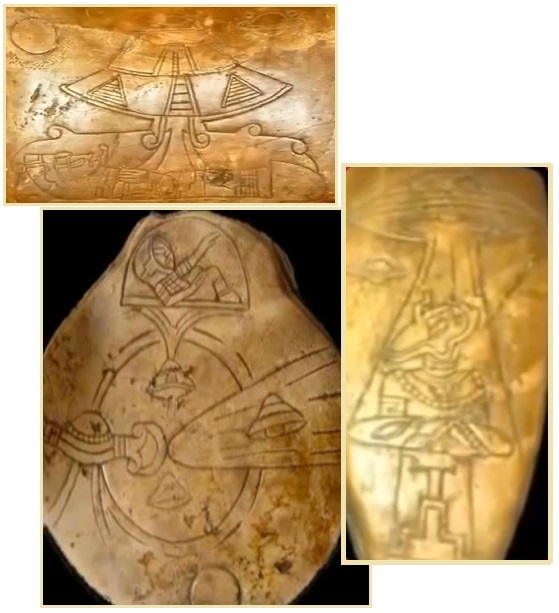 The Mexican government is releasing further evidence in their possession showing some kind of hominoids using space ships – ie extraterrestrial visitations in the past. Per the Zetas, what is being depicted are the Annunaki. This issue came up in 2012 also, but at that time the Mexican government was leaned on by its weighty neighbor to the North – the US - to withhold these documents. With the cover-up over the alien presence at the breaking point, they are now stepping forward with evidence in their possession. In what will soon be considered as the Holy Grail of extraterrestrial research, the Mexican government has released ancient documents proving the existence of E.T.s once and for all. The order to collaborate had come directly from the country’s president, Álvaro Colom Caballeros. “Mexico will release codices, artefacts and significant documents with evidence of Mayan and extraterrestrial contact, and all of their information will be corroborated by archaeologists”. ZetaTalk Comment 3/31/2012: The key piece of evidence just being revealed is the chamber the Mexican government is opening to the public for the first time. This does indeed indicate Annunaki space travel, their evacuation as a result of the quarantine the Council of Worlds imposed. And in cooperation with the US government in their long running cover-up over the alien presence the Mexican government kept this sealed lo these many years. This is certainly not the only such archeological evidence of this nature. But is there proof that aliens have visited Earth? The Annunaki are close enough to the human genome that interbreeding can and did occur, so would pass the DNA test. Lloyd Pye’s Starchild Project sought for years to get proper DNA analysis of the skull in his possession, was blocked on every turn, but died before a thorough analysis could be done. But anyone looking at this skull can see it is not human, nor is it Annunaki. 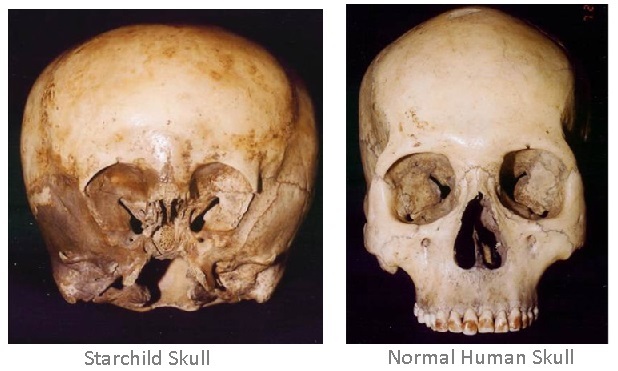 The Starchild Skull exhibits both physical and genetic differences that distinguish it from a typical human skull. The Starchild’s zygomatic arches (cheekbones) are broken off, but from the small fragments that remain it is clear that the space between the cheekbones and the other bones of the face is much smaller than it would be in a normal human. This is significant because the chewing muscles for the lower jaw pass through this space, and so must have been much smaller than in a normal human. The Starchild’s neck muscles attach in a way that indicates it was a very small neck relative to typical humans, no more than half of normal size. Human neck muscles normally attach at an elevated point in the rear center of the occipital bone (the rear bone of the skull). That elevated point is called the “external occipital protuberance,” or “inion” for short. All humans, and indeed all primates on Earth, have an inion. The Starchild Skull does not. In 2011 elongated heads from Peru in Cuszco were in the news, as detailed in Issue 269 of this newsletter. By appearance, and by consensus of the doctors examining the skull, this was not a human skull or mummy. The Zetas agreed. But in 2011 DNA testing had not yet been done. Announced the discovery of a mummy with no human characteristics. The body is 50 inches tall, triangular head, eye cavity too large, open fontanelle, which is only characteristic of children up to 1 year and has molars, which show that there is a tremendous gap that is not common in humans. Spanish and Russian doctors have come and we have confirmed that this is indeed an extraterrestrial. 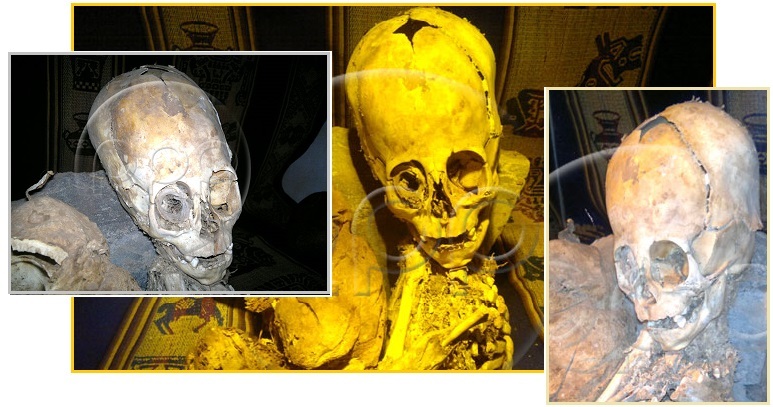 It also has the front split skulls and that does not exist in any ethnic group in the world, as only found in the Andes of Peru, like the Inca bone is a triangle on the occipital and exists only in the Andes of Peru. Now DNA testing has been done on those skulls from Peru! The results? Not human! Why the reluctance to admit alien visitations? The USA has sustained a cover-up over the alien presence since the days of Roswell, due to Executive Orders signed by Reagan. It was all deemed too shocking for the common man, who would become unhinged, apparently. The CIA and DIA could deal with it, per their logic, but the rest of humanity would become unhinged. Per the Zetas, this reluctance is also due to denial, as to admit alien visitations is to admit that man is not alone, not so special, and perhaps, not the brightest hominoid around. ZetaTalk Statement 8/15/1996: Any remains that would tend to look hominoid, but not human, would frighten a human coming upon them, and these types of situations tend to result in active denial. The remains are left where they are found, and even if documented and pressed upon colleagues, denial prevents them from being taken seriously. If for no other reason, denial occurs because the researchers have difficulty realizing they are not alone, not the first or most intelligent conscious species in the Universe, not the masters of all they survey. One looks the other way, walks away, and then forgets to mention the find in their report. Skulls of hominoid visitors, as well as intact skeletons of non-hominoid visitors, have been recovered by human researchers and documented. These discoveries never make the press, as the media find them too disturbing. There are solemn moments, hushed silences when no word is spoken. Then someone mentions that the public might be disturbed, might faint or attack the media with claims of fraud. The bones that don't get displayed are hominoid skulls that obviously have more brains than mankind, big heads that humans today don't possess, much less the heads of early man. Who wants to break this news when they would have to be faced with all those egos out there being taken down a notch! Almost daily, photos or videos capturing evidence of the Planet X complex are posted on the Pole Shift ning blog dedicated to these captures. These vary from dramatic Second Sun captures at sunrise or sunset, to brilliant Moon Swirls clustered around the Sun, to Moon Swirls seen from the side, looking like long tubes. Often there is correlation, what is captured by one person in one location being echo’d by another person in another location. 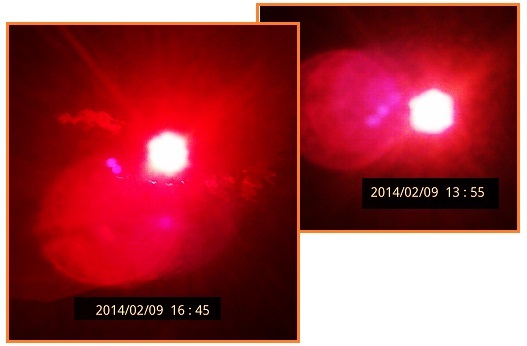 This happened early this month when sunrise photos taken at the crack of dawn on February 7, 2014 matched photos taken with a filter for light in the red spectrum by Alberto in Italy in the afternoon on February 9, 2014. There were no planets near the Sun at either time. 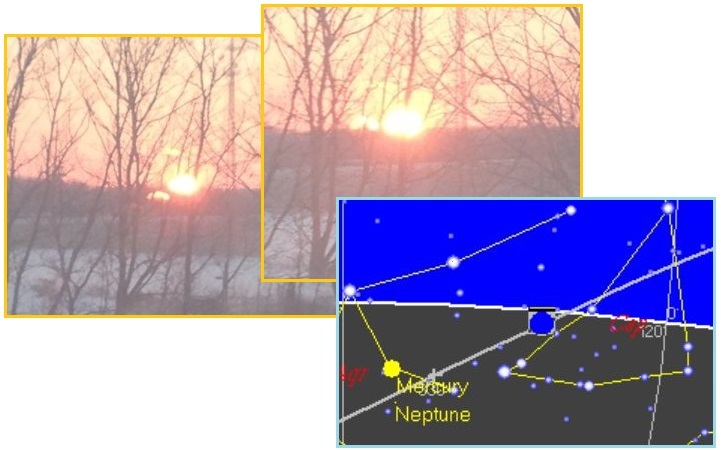 The sunrise photo in Indiana shows a bright orb, in what the Zetas call the Monster Persona, to the left of the Sun, shining through the trees along the horizon. 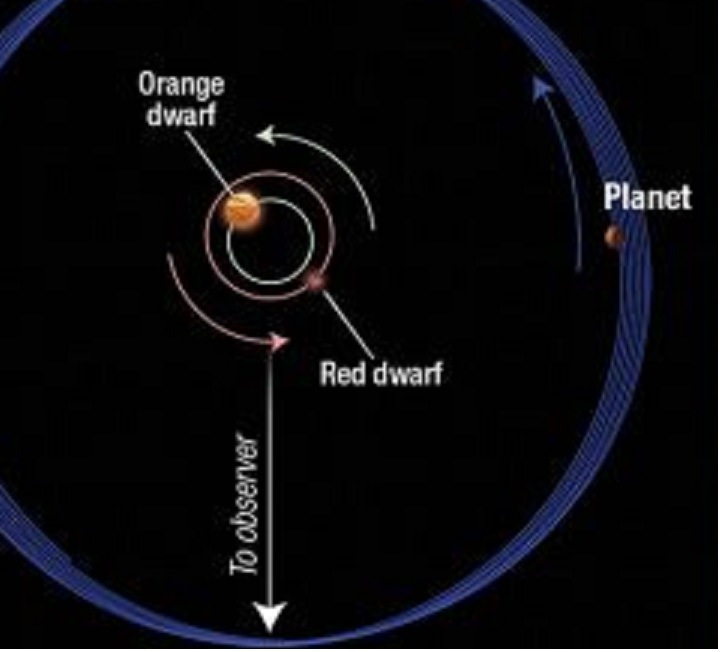 Numerous articles have been appearing in the press recently, preparing the public for the concept of Nibiru (aka Planet X) as a traveling planet in a sling orbit between two suns, one of which is unlit, while traveling afar ways from both suns during this sling. In Issue 370 of this newsletter the subject of lonely planets without an apparent sun as an anchor was covered. But by Issue 382 the press was abuzz discussing a red tone to free floating planets, planets orbiting dead suns, planets with long orbits that took them afar from their suns, and dim suns orbited by water planets that could potentially support life. One aspect of the announcement admitting the presence of Nibiru not yet addressed in the press is the Earth wobble, which the establishment has had difficulty blaming on solar emissions or Global Warming or any of the other excuses they use to explain the Earth changes caused by Nibiru, aka Planet X. But the most recent Kepler system revelation is addressing a planetary wobble. The Daily Mail even packed references to wobble and weather and rapidly changing seasons in the title. Nasa has found a unique planet which wobbles on its axis - causing weather conditions to be even more erratic than those on Earth. Astronomers were stunned to find the planet, designated Kepler-413b wobbles wildly on its spin axis, much like a child's top. The tilt of the planet's spin axis can vary by as much as 30 degrees over 11 years, leading to rapid and erratic changes in seasons. It circles a close pair of orange and red dwarf stars every 66 days. Astronomers have discovered an alien planet that wobbles at such a dizzying rate that its seasons must fluctuate wildly. Kostov and colleagues are still investigating what causes the extreme wobble of the gas planet, which has a mass about 65 times that of Earth. They say Kepler-413b's orbit may have been tilted by other planets in the system or by a nearby star exerting gravitational influence. The Earth wobble has become increasingly obvious, often covered in this newsletter as it is proof of the nearby presence of Nibiru, aka Planet X. Problems with airplane navigation, weather extremes in lands on the same latitude, following the Figure 8 pattern, and breaking heat and cold records in neighboring lands, causing retro storms, piling ice up on shorelines, creating lopsided ice at the poles, showing up on weather sat images, showing up on webcams, and in webcam year-to-year comparisons have all been featured in this newsletter. The Zetas have predicted that the wobble will worsen as Planet X draws closer, as part of the 8 of 10 phase symptoms. We are currently in an overlap, completing the 7 of 10 plate movements with the predicted 8 of 10 changes. The increased wobble predicted for the 8 of 10 phase is being allowed to proceed while the 7 of 10 changes were slowed to allow the announcement to occur ahead of major plate movement. ZetaTalk Explanation 10/12/2013: We have stated that the 7 of 10 pace has been slowed to allow the planned announcement admitting the presence and pending passage of Planet X, aka Nibiru to occur. We detailed some of the effects of the slowing to be a lower magnitude of anticipated earthquakes in Japan and N America and along the spine of the Andes, and a virtual elimination of the European tsunami. We stated that even after the announcement, the 7 of 10 pace would not simply be released to return to a sudden and violent pace, but some time would be granted to the world’s people to react. The 8 of 10 phase changes have been allowed to proceed, so the Planet X complex has become more visible and the Earth wobble more distinct and violent. The greater visibility of the Planet X complex and increased wobble during the 8 of 10 phase occur because Planet X draws closer, coming from the right in its retrograde orbit, and as it does the Earth pushes to the left as far as possible. Thus the planets are more side by side than previously, and light can be at the right angle to bounce off the vast dust cloud shrouding Planet X, creating those dramatic Second Sun sightings. ZetaTalk Prediction 12/4/2010: This is information that coincides with the 8 of 10 scenarios, as yet undescribed, and with the anticipated position of Planet X vs a vs the Earth for enhanced viewing of Planet X from the astonished residents of Earth. This time has not yet arrived. This side-by-side arrangement creates a more violent wobble because Planet X is blasting the Earth with the magnetic particles from its magnetic N Pole more from the side, tipping the globe into a slight lean to the left. This is an easy position for planetary magnets to assume, per the Zetas. They can go end-to-end, as has been occurring when the magnetic N Pole of Earth is tipped away during the daily wobble. Or one of the planets can go into opposition, laying along the magnetic fields lines of the larger planet, which the Earth does on occasion when the Sun is suddenly high overhead in the Northern Hemisphere. Or they can take a T formation, which is what would be happening during a transient or slight lean to the left. ZetaTalk Description 10/6/2012: Magnets want to go side-by-side (as the planets do with the Sun) or end-to-end. They can temporarily form a single field, the smaller magnetic field being absorbed into the larger field, or the smaller one can appear to twist if not directly end-to-end. If not allowed to go end-to-end and too close for a side-by-side arrangement, the lesser magnet can go into opposition or attempt to form a T arrangement, which for the Earth is a lean to the left. BATRSUS is showing the approach to a side-by-side alignment too. Per the Zetas, where Planet X used to point its hose of magnetic particle directly at the Earth, it is increasingly pointing this hose out into space behind the Earth. The following anomaly (small maroon area on the left) appeared briefly on BATRSUS. I believe the color code scale at the lower right of each image represents a normalized numerical value for particle density in the solar wind where the deep blue color at the bottom of the scale represents low particle density and the red at the top of the scale represents high particle density. Any red shading has always appeared in front of the bowshock and is indicative of particle crowding resulting from high velocity particle impacts to the magnetosphere. For the blood red shading to appear far behind the bowshock, regions where the magnetosphere usually consists of the lowest particle density, suggests a sudden influx of high density particles. This was weird. ZetaTalk Explanation 2/15/2014: The blast from the side does more than give the Earth a more violent wobble, it also tends to point the hose of magnetic particles coming from the magnetic N Pole of Planet X out into space behind the Earth, rather than directly at the Earth as had been increasingly occurring. From the standpoint of BATRSUS satellite analysis, any blast from Planet X was interpreted to be a blast from the Sun, a stronger solar wind. Thus BATRSUS is not programmed to interpret a magnetic blast coming from the side, and flounders. 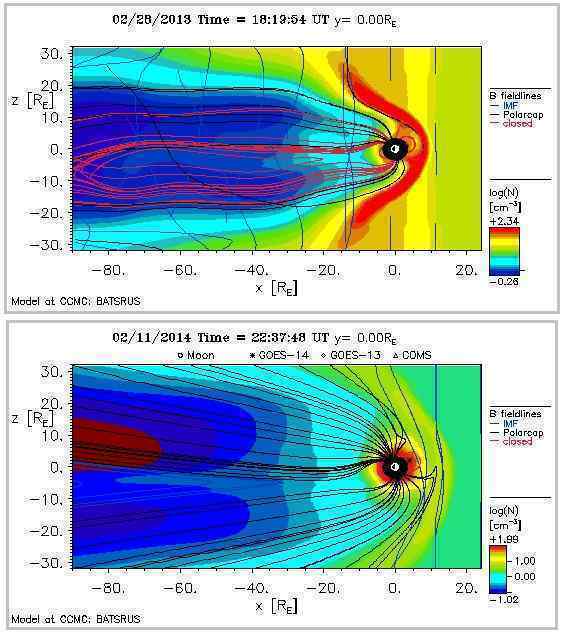 The purple cone is thus an attempt by BATRSUS to model the magnetic blast, registering this behind the Sun rather than at the blowshock location. Another aspect of the Earth wobble is erratic tides, not explained in any other way. These have become increasingly apparent as the wobble has increased. ZetaTalk Insight 12/22/2012: What is the common denominator in high tides in the UK and Europe, California and British Columbia, Australia and Indonesia – all virtually at the same time, on December 13-14, 2012. This is clearly from a severe wobble of some sort. There were many reports during this same time period of the Sun being too far South, the sunrise being too early and the sunset lingering and being late. A tilt of the Earth into opposition was responsible, and when the Earth flings about trying to accommodate the magnetic hosing coming from the N Pole of Planet X, sloshing of the oceans occurs. Why else would coastlines along both the Atlantic and the Pacific be involved, simultaneously? Yet another aspect of the Earth wobble is the predicted blending of the seasons, which the Zetas say will not truly arrive until just before the Last Weeks, which is the 9 of 10 phase. ZetaTalk Qualification 10/6/2010: The blending of the seasons will be a phenomena that will occur during the 8 of 10 scenarios, in the time prior to the last weeks. Due to the Earth wobble, there are many phenomena in many parts of the globe which could be described as unseasonable weather. Snow in summer has occurred and is on the increase. Very warm days in the middle of winter, more than the typical winter thaw, so that fruit trees bud in winter, ruining the harvest when frost returns. But the blending of the seasons will be characterized by extreme change happening rapidly, one direction to another. What you have had up until the present is trends for more extreme weather. Imagine going from the heat of the hottest summer day to the cold of the coldest winter day, all within a day or so. That is a blending of the seasons.